Last night, we just needed a break from all the school work, piano and "stuff". 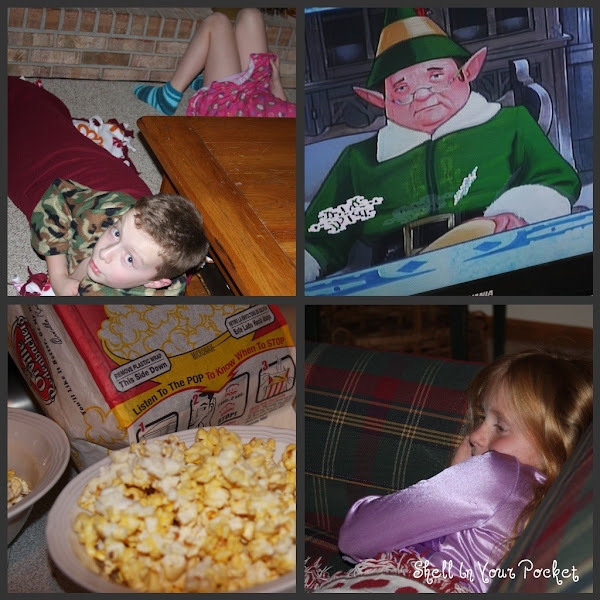 We all sat down and watched "The Elf". I love that movie. It makes me laugh because he is such a "nut" and REALLY thinks he is an "elf". I love when he goes into the coffee shop and congratulates them! It's great! There are so many great Christmas movies out. Just pop some popcorn and make it a "movie" night! Christmas is going so fast and honestly, I haven't even "stepped" on the Christmas train- not one gift bought, not one cookie baked...I guess watching "Elf" got me in the season to pull out the candy canes and flour. Monday I am going to post an "old" blog post- It's our favorite tradition- it's easy but a Keeper! --you need "popcorn" for this one too!